Over the years my travel schedule has become increasingly more and more rigorous. In 2015 I traveled well over 300 days and toward Christmas I decided that I wanted a new hunting partner to be with me on the road. 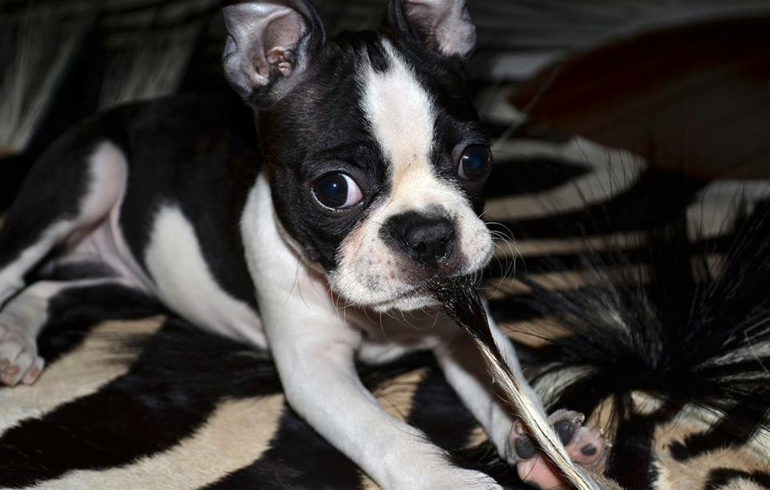 So my wish was granted and a little Boston Terrier female was delivered for me on Christmas. This may have been the best Christmas present I have ever received, and I was instantly in love. I had already picked out the name I wanted and needless to say my parents were not impressed with my choice, her name was going to be pork chop. I figured I would baby her, dress her up and spoil her, however I didn’t want her to have some little girly name. Pork Chop was something no one would forget and it fit her perfect. So the day after Christmas, Pork Chop and I headed back on the road for my scheduled hunts and she began her life as a traveling puppy. Now only 3 weeks later she’s been with me on 3 hunts, attended one tradeshow and she absolutely loves it. She is constantly in my arms whether I’m editing, hunting, or traveling. Flights are pretty easy as I just put her in a little carrying case and stick her under my seat. She just goes right to sleep and doesn’t whine or cry at all…which is really helpful. plane, so if you plan to travel with a small animal in the cabin, you need to call ahead and have them put it on your ticket. With her life starting out in the frigid Minnesota weather, you can image the delight in her eyes when we landed in the hill country of Texas and she was able to play in the grass and warm weather. Instead of leaving her home during the day while I hunted, I decided to bring her with in the blind and she just sat still and watched. When she got tired, she laid down and slept for hours. 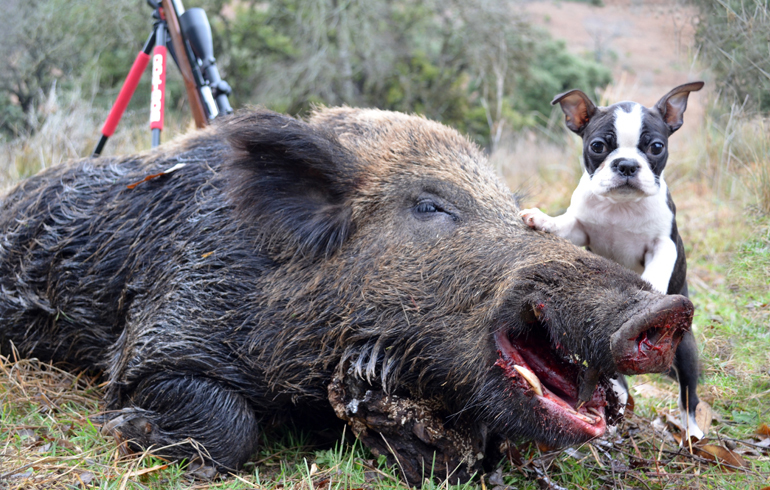 Finally when I had a hog come in and I was going to shoot, the guide held his hands over her ears and I dropped a big boar in his tracks using my .300 Win. Mag and Deer Season XP. The hog went right down, and pork chop didn’t mind one bit. We went out of the blind and she was excited to sniff around the hog, climb around, and I was able to snap a cute pic where she looked like this was a hog she took herself, one proud puppy. 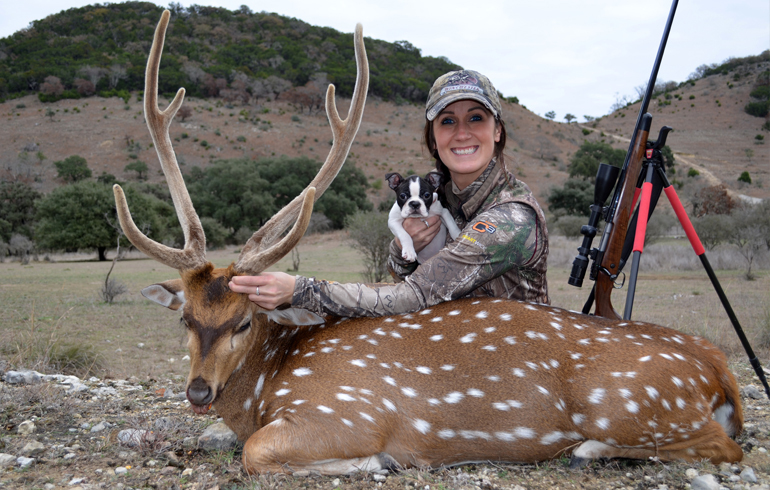 The next day I was able to shoot an axis deer with her in the blind as well and now she understood the routine. Once a shot was fired, it was time to go explore! Once again another adorable picture of her with my axis deer and now I was absolutely hooked with having her next to me as much as possible. One big concern I have however is her attacking or destroying the mounts in my house. For a puppy all the smells and animals look like toys for her to play with. 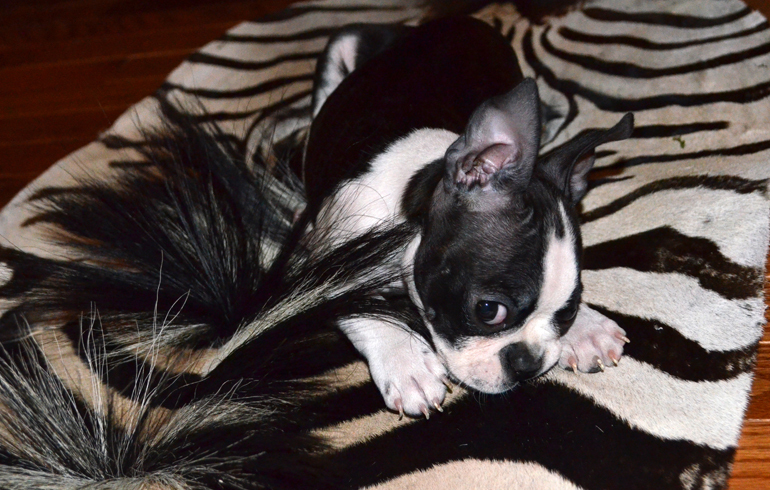 I think once we get back home for the winter, I’ll have to spend a little time puppy proofing my house, but it didn’t take long for her to take a liking to my zebra rug. Not sure if she just liked chewing on the ear, or if she realized she had found the perfect camo for herself and is a natural born hunter! For everyone out there that has little dogs they hunt with or just as companions, you do need to remember to check with your state’s DNR regulations as some places do not allow you to have dogs in the blind; even if they’re puppies and no assistance to you at all. It’s always worth checking and fun to have a new hunting partner to share the fun of travel and life on the road.